Yesterday Malcolm told me that my nickname is “dictionary.” I love it! I more than love it, I’ve decided that I want to be a superhero called “The Dictionary.” I wouldn’t be a snarky sort of superhero who went around telling people they used the wrong form of “their,” or they used “less” when they should have used “fewer.” First of all, that’s a job for the word police. Second of all, Lord knows I make plenty of mistakes myself. And finally, I believe that using words incorrectly and spelling them irregularly might be what keeps language alive and changing and growing. And naturally, as The Dictionary, I’d be like the OED. I wouldn’t tell people what words mean, but what they have meant and how people have used them differently over the centuries, how their meanings vary from year to year and place to place and usage to usage. I’d resolve conflicts by showing the combatants that their words have shades of meanings, and if they only shift their understanding slightly one way or another, everybody could get along. I’d show how “attack” can mean, “To enter upon a work of difficulty, with the intention of conquering and completing it.” So we can decide together that the work of difficulty will be an epic novel or an opera in twelve acts, and we’ll all attack it together. I’ll point out that “take” originally meant, “to put he hand on, to touch, to lay hands upon, to accept what is handed to one, or even to understand.” And it still means, “to take root, to germinate, and to begin to grow.” So we’d all marinate on those meanings for a while, and maybe plant a garden together and watch and wait for the seeds to take, and forget why we were fighting. Because, of course, we could all fight together…we could all fight disease or fight poverty or ignorance instead of each other. And I’d swoop down in classrooms and explain that “essay” means “to try,” and that the important thing is the attempt itself, the process. And before you know it everybody would be as delightfully bewildered by vagaries of meaning as I am, and everybody would agree that nothing is written in stone or immutable, and that everything is open to interpretation and we’d all be expressively unintelligible and unproductive. I made some caramelized onions last summer and froze them for a wintery day. We’ve had a lot of those lately! I decided to put them on this pizza, which also has capers and black olives. And, it has white sweet potatoes mashed with ricotta cheese! White sweet potatoes have a mildly citrus-y flavor that I like a lot. This whole pizza was a mixture of sharp flavors and comforting textures, and I liked it a lot. Here’s Words of Love by Buddy Holly. Combine the yeast, sugar and half a cup warm water in a small bowl, and leave in a warm place for about ten minutes to get foamy. In a large bowl combine the flour, pepper, and salt. Make a well in the center and add the yeast mixture and the olive oil. Stir well, and add enough warm water to form a soft dough. You want it to be as wet as it can that you can still comfortably knead it. Knead for about 5 minutes until soft and elastic. Put about 1 tablespoon of olive oil in a large bowl. Roll the dough in this so that it’s evenly coated. Cover the bowl with a damp cloth and set aside for two to five hours, till it’s doubled in size. Boil the potatoes in salted water until just tender. Turn off the heat but return the potatoes to the burner to dry out a bit. Add the ricotta and mix well. If it’s too thick you can add a dollop of milk. Preheat the oven to 450. Lightly coat two large baking sheets or pizza pans with olive oil. Spread the dough on sheets, spreading it with your palms and fingers till it’s quite thin, and building up a crust on the edges. Prebake the crusts for about five minutes till they just lose their shine. 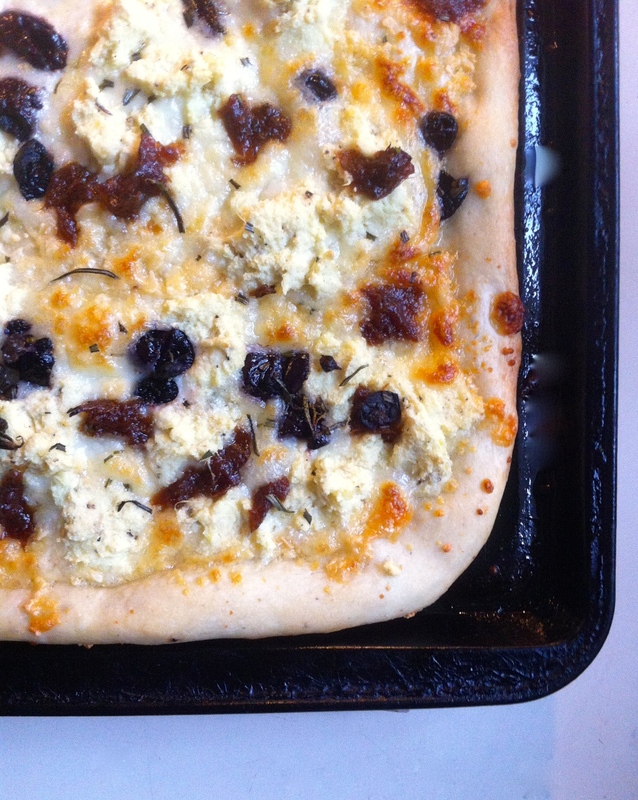 Sprinkle the cheese on the crust in a thin even layer, and then scatter olives and capers over that. With a teaspoon, arrange dollops of onions and sweet potato/ricotta mixture over the cheese, as much as you like. Scatter the rosemary over that. I had some sweet potato & ricotta mixture left so the next day I added an egg and baked it into little croquettes. Bake until the cheese is melted and the crust is golden. Melt 2 T butter in a large frying pan. Add the onions, chopped into 1/4 inch wide pieces, and 2 or 3 thyme sprigs. Stir and fry for about five minutes, till they’re wilty and reduced. Reduce heat, cover and cook for 20 minutes. Add 1/2 cup dry white wine and one teaspoon salt. COok for about another hour, stirring every 20 minutes or so – more as you go along towards the end, when the onions will start to be a bit sizzly and brown. When they’re caramel colored, reduced, and very soft, and 1 t sherry vinegar and lots of pepper. This entry was posted in bread, crust, potatoes, recipe, Uncategorized and tagged caramelized onions, olive pizza, sweet potato pizza, white sweet potatoes by Claire. Bookmark the permalink. I take it Dictionary seeks peace, understanding, harmony. Thanks, Dictionary. Start swooping.